So I’m hosting a murder mystery garden party in July. I did one two years ago and it seemed to be a big hit, so here we go again. While my first was set in Upton Abbey in 1912 (pop culture tie-in! ), this year’s epic will take place on the Catsby Estate in 1921. Because I never do anything in a small way, I’ve been scurrying to prepare periodesque costumes for my cast of suspects (my put-upon kin). This involves long strings of pearls, decorative fans, feather boas and especially hats. It turns out that the reason custom-made hats available for purchase are so dear is less because of the artisanship of the creation than the expense of the doodads and gew-gaws to pretty them up. “Upcycling,” it appears, means starting with a $2 straw hat and adding $200 worth of feathers. I can see where ostriches would be reluctant to part with their plumes for a nickel, but $35 each seems a bit rich. I may go into ostrich feather farming to make my fortune. Part of my problem is that I’ve never subscribed to the “less is more” or “tastefully understated” philosophy. More beads! More ribbon! More, more, MORE shabby chic roses! For a month, my bedroom (well, let’s just call it a workshop, shall we?) has been strewn with appliques and puff balls and strands of beads. The cats are delighted. I’ve come to cringe at the knowing smirk of the clerk behind the till at JoAnn Fabrics when I haul my latest trove of fancies up to the counter. Really, though: is ANY ribbon, no matter how sparkly, worth $17.95 a yard? And do I REALLY need two yards? 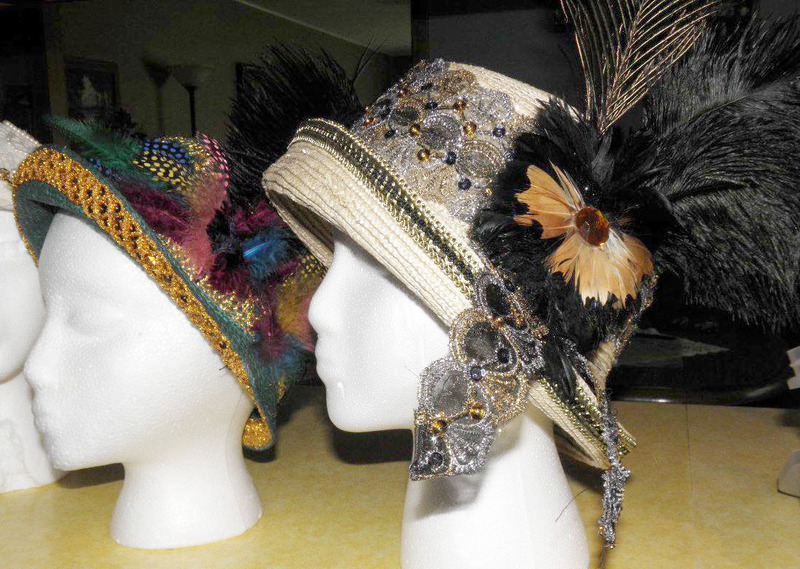 An unexpected – Well, I probably should have anticipated it, though I never was much good at physics – effect of all this razzle dazzle is that each of the hats now weighs about five pounds. I expect to be hit with chiropractic bills from my injured relations after the party. 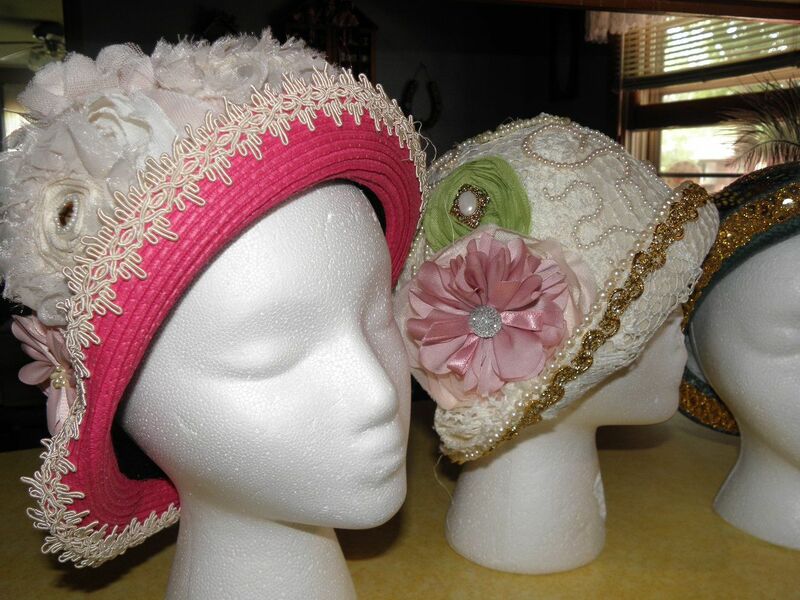 I finished my four hats this weekend. I look forward to seeing my sister and nieces in them. And to justify the moolah I’ve splashed out on the damned things, look for me to wear them to church, work and the grocery store every day from now on.